EvoStar Best Paper Awards 2014 were presented for EvoSTAR, EuroGP, EvoCOP, EvoMUSART, EvoCOMNET, EvoPAR and EvoIASP. EuroGP also presented a Best Reviewer Award to acknowledge the hard work put in by reviewers. More details on these awards here . The EvoStar 2014 Conference Handbook is now available for download here in pdf format. The EvoStar 2014 Full Programme is now available for download here in pdf format. The Submission Deadline for all conferences has been extended from the 1st November to the 11th November 2013. This will be the only extension. 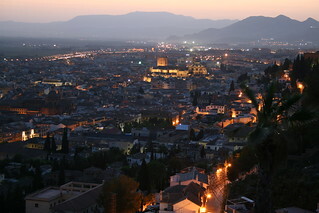 EvoStar 2014 will be hosted in the city of Granada in Spain between the 23rd and 25th April 2014. An award for the best overall paper at EvoSTAR is being offered by the "Granada Excellence Network of Innovation Laboratories" (GENIL). The prize includes travel expenses and funding to allow the winner to spend one month with one of GENIL's research groups. More information can be found here. Links to Previous EvoSTAR events can be found at the bottom of the menu located on the left hand side of this page.